Located right next to the large sandy Los Naufrugos Beach (blue flag) and only 10 metres from the sea, our sunny apartment is about as close as you can get to the water without getting wet. The apartment is located on the first floor and front line, straight opposite the sea with only a walkway between the apartment building and the sea, The views are amazing - As soon as you enter the apartment you see the Sea through the large patio doors and windows Relax on the apartment Terrace listening to the sound of the waves as they break on the beach - Watch the boats coming in and out of the harbour and enjoy the view of one of Torrevieja´s most popular beaches. At night you can see the pretty lights of Torrevieja city and Harbour and in the mornings (if you are up early enough) you can see the sun rise over the sea. The Apartment has a very spacious open plan living area with comfy sofa seating facing a 46 " flat screen smart TV with internet access (Digital Spanish TV) there is also WIFI Internet included. The dining area has seating for 6, and there is an open plan kitchen which overlooks the living area and looks out to sea. Hot/cold Air conditioning in the living room. From the living room there are glass patio sliding doors which lead onto the Terrace where you will find a small dining table and seating for 2/4 persons, plus comfy lounge seating to relax on and enjoy the views. There is a wind out awning for shade. The master Double bedroom (double bed) has great sea views. The Family Bathroom has a bath. The second bedroom (with double bed) has private ensuite shower room. The apartment is fully furnished for Holiday lets. The whole apartment has been recently re-furbished in a clean and modern style. Located right next to Los Naufrugos Beach (Blue Flag) on the south side of Torrevieja and only 10 metres from the Sea. The apartment is on the first floor and front line, to the sea with only a walkway between the apartment building and the sea. The building is situated on Ave. Desidereio Rodriguez which is one of the main roads leading into Torrevieja town centre, however once inside the apartment you cannot hear or see any traffic noise from the main road, all you can hear is the sound of the Sea waves as they break on the beach. There are Lots of local “Spanish” caferterias and restaurnants, bars , shops , mini markets pharmacy bank etc all within easy walking distance main and the mainTorrevieja centre is only a 10-15 minute walk away. We bought this apartment recently because of it's excelent position and views. The apartment was renovated, we added two brand new bathrooms and re-furnished the whole apartment. We have been living and enjoying the apartment for the past year however we are going to live in land over the Winter hence the apartment is there for others to enjoy. We will be moving back in next Summer. We feel that you you will be hard pushed to beat the views out of the property and the location is superb, only a stones throw from the beach (literally) and in easy walking distance to all amenities. THE VIEW.........THE LOCATION............ The views are fantastic, you look straight out to sea, watch the boats sailing out of Torrevieja harbour. First thing in the morning watch the sunrise over the sea. The location is also great, only 50 m from Naufragos Beach(Shipwreck beach) (Blue Flag). There are probably about 15 restaurants within a 5 min. walk. Choose from traditional Spanish to Mexican, Norwigian or Polish. 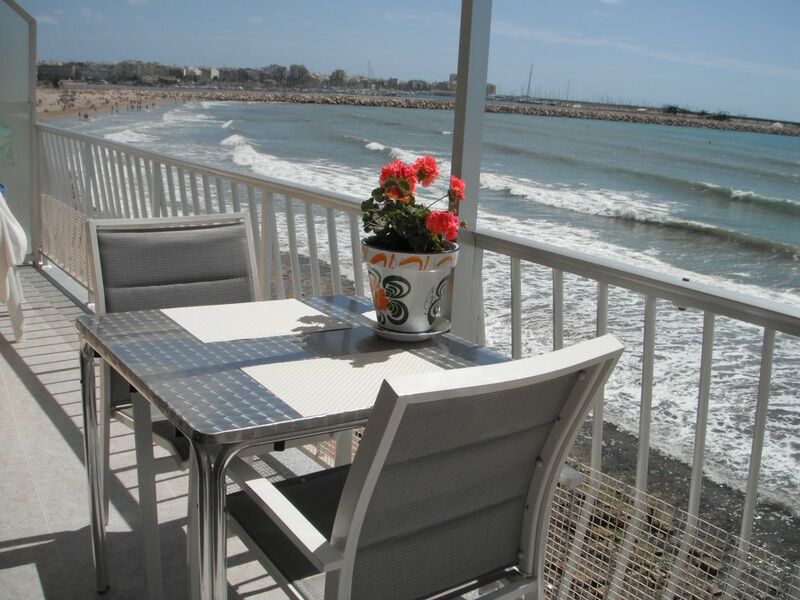 The apartment is only 50m from one of the most popular restaurants in Torrevieja, Meson de Huertano. Here you can get a typical 'menú del dia' ( menú of the day a three course meal with a drink) from only 10 €. Full Internet Wifi Access is included. There is a Smart TV with internet Access as well. Open plan modern kitchen. Enjoy the sea views while you cook. Fantastic balcony which runs the length of the apartment and looks directly out to sea. All sorts of watersport are available from the marina. Apertment with sea view for these who love sea, sandy beach and sun. Clean, fresh and well equipped. Great location, fabulous views. Lovely apartment and view, cannot fault the view and the sound of the sea crashing onto the rocks is amazing. Andrei the owner is very polite and helpful, allowing our stay to be as relaxing as possible. I would book again as my partner and I had a really good time and lovely restaurants around the property but a lovely walk into Torrevieja also. The place was nice and clean. Location was good. Me and my partner stayed here for a week in September. The apartment was beautiful. Had everything you could need and the amazing views of the sea are beautiful. The beach is literally downstairs with shops and restaurants all close by. We had a beautiful stay and the owner couldn't of been more helpful. Hope too cone back again. As the apartment is situated right by the sea there are numerous wáter activities to enjoy from just plane swimming and snorkaling to wáter skiing, canoeing, windsurfing, sailing and fly boarding. Añternatively enjoy a stroll along the footpath right outside the apartment by the waters edge, walk one way and you end up in the town centre of Torrevieja with all it's bars shops and restaurants. Go the other way and you can walk for miles passing the beaches of Mar Azul, Punta Prima, Playa Flamenca, La Zenia, La Withright up to Cabo Roig. This is also a great cycle route. Within approx. 500 m there are numerous (probably about 15 bars and restaurants some of which are on the beaches of naufragos and Acequion. Only 50m from the apartment you will find one of Torrevieja's most popular restaurants Meson Huertano ( very popular with the Spanish locals), here you can get a great menú of the day from 10 € ( three course meal with a drink).